Brown Recluse spiders are also called fiddle backs. They get the name from their reclusive behavior and fiddle shaped design on their back. Adults are generally about the size of a quarter. They have long legs and hold themselves up high off the ground. 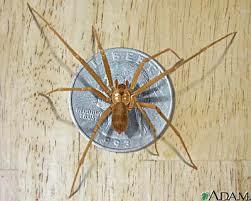 Brown recluses are light brown in color. They do not make webs but prefer dark, moist, undisturbed areas like crawlspaces, attics and closets. If provoked, they will bite and it can be painful. There is no cure for infected areas other than removing skin and areas that are dying. If left alone, infected areas spread all over. Medical attention should be sought if bites are suspected. Outdoors they prefer shingles, unused boxes, woodpiles, or clutter in garages for shelter. Pest control is recommended for houses with these spiders.